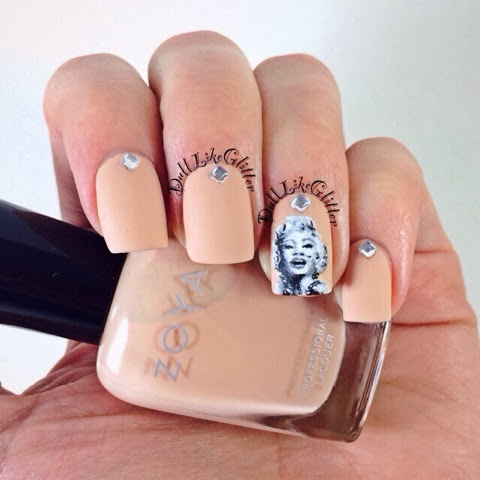 Saving the World One Nail at a Time: Marilyn Monroe Nails! This nail art is a blast from the past! I felt like I hadn't done any nail art in awhile so I wanted to do something spiffy. Some Like it Hot, the classic Marilyn Monroe film, was showing on PBS over the weekend and inspired me to try for a realistic portrait look. I created this look using Zoya Chantal, Glisten and Glow's HK Girl Top Coat, Butter Lodon's Matte Finish Top Coat and Born Pretty Store's stud wheel. While I was working on these I ran out of white paint! I had to stop before I was completely done but it was to a point where I liked it and decided to go with it anyway. The studs were inspired by Diamonds are a Girls Best Friend. Using Glisten and Glow's HK Girl Top Coat really locked the studs in so that they lasted until I took the nails off. I used Butter London's Matte Finish Top Coat over that to give it a flatter, less shiny look. When I have created nail looks like this in the past I'll always have a few people that think they are stickers. To show my process, I made a stop motion Vine! What do you think of my in-process Vine? Would you like to see more videos like this from me?